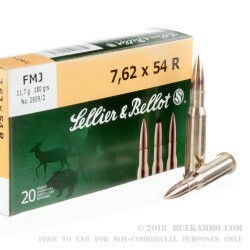 A fantastic round by Sellier & Bellot for the much beloved 7.62x54R with a shiny exterior and a very nice performance curve. This is a 180 grain full metal jacket projectile in a brass case with a Boxer primer which is an obvious value add, especially considering S&B’s excellent brass. This ammunition offers significant performance for any scenario you decide to use it for. The 180 grain round could easily take the vast majority of large game in North America. The accuracy potential of this cartridge hovers near 2 MOA and generally can be shot to better than 1.5MOA out of most regular rifles with some basic changes. The round itself is quite an accurate round, and the rifles that shoot it, are generally mid range for accuracy. With the right optics, bedding and barrel work, or a factory accurized rifle, this round could easily shoot at the 1MOA level. Q: Other than age, what separates this ammo from the military surplus ammo sealed in tins? Do you plan on carrying the military surplus ammo in the future? 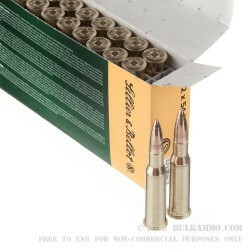 A: This S&B 7.62x54R is brand new, non-corrosive ammo loaded in boxer-primed brass cases that are suitable for reloading. Surplus 7.62x54R is corrosive and non-reloadable. A future supply of surplus 7.62x54R ammo is uncertain. 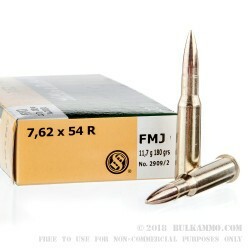 Q: Do you think you'll ever get any of the surplus "spam can" ammo in 7.62x54r? A: From time to time, we do get surplus ammunition. By its very nature, this is not a constant, in-stock item, and we cannot currently predict if or when this will occur in the future. Q: I hope to take my Mosin deer hunting this year. Is the best hunting round in 7.62x54r for the Mosin? 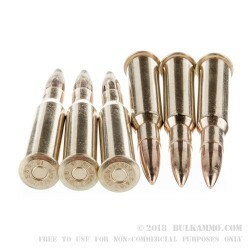 A: FMJ (full metal jacket) bullets are generally designed to be legal for use in land warfare or for ease of manufacture, not for ideal terminal performance. In 7.62x54R, the selection of projectiles for hunting is limited, but a soft point (SP) or hollow point boat tailed (HPBT) bullet would be a better choice.